Six hundred business leaders from across the UK last week attended a special dinner to fundraise for The Prince's Trust. 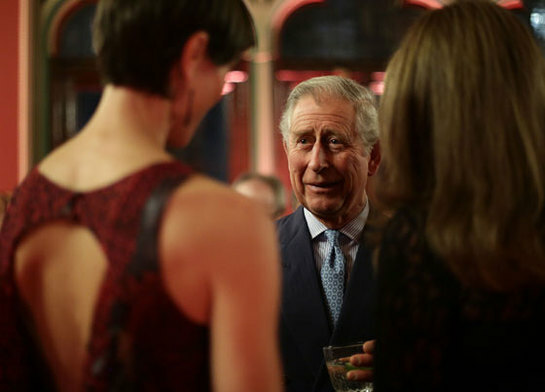 The Prince of Wales talking to guests, during a leadership reception hosted by The Prince's Trust at The Royal Courts of Justice in London. The Prince of Wales praised the work done by football clubs to help his youth charity. The Prince’s Trust Football Initiative has helped more than 22,500 disadvantaged young people since 1997. The scheme, which is delivered by 40 professional clubs, offers motivation, team-building skills and a chance to gain qualifications. It is funded by the Premier League and the Professional Footballers’ Association. In a speech to open the Prince’s Trust leadership reception at London’s Royal Courts of Justice, His Royal Highness said: "We have had a relationship now with the Premier League for 17 years, which I think has made a fantastic difference through working with the football clubs all around the country. Hosted by newsreader Katie Derham with speeches from HRH and Richard Scudamore – chief executive of the Premier League – the fundraising event united business leaders to raise over £507,000 for The Trust. For many guests the highlight of the evening was hearing from Prince’s Trust Young Ambassador Catriona Glover. Catriona spoke movingly about how The Prince’s Trust helped turn her life around following a serious attack. The Prince’s Trust and EMC Leadership Dinner celebrate a truly remarkable and collaborative approach to fundraising by The Prince’s Trust Leadership Groups. These Leadership Groups have grown to represent over 200 companies and individuals. Corporate support of The Trust will raise over £17 million for The Prince’s Trust this year alone. The Leadership Dinner has raised more than £1million for The Trust since 2010, giving some of the UK’s most disadvantaged young people the skills, confidence and motivation to get their lives on track.